Attendees of an affordable housing symposium, held at Griffith University, heard CHIA CEO Peta Winzar speak about the Federal Government’s September release of key reports, draft legislation and a consultation paper, which collectively signal a major shift in government thinking in relation to financing social and affordable housing. Ms Winzar told the symposium that these four measures, together with some complementary budget measures announced by some state governments this year, have the potential to significantly alter the financing landscape for affordable housing. 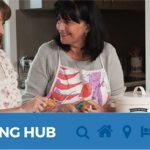 The Affordable Housing Working Group, which was set up by state and federal treasurers to investigate innovative ways to finance affordable housing has released its report with three recommendations. Its prescription for closing the funding gap between rents and operating costs contain no surprises – targets, planning mechanisms, tax reform, contributions from affordable housing providers, and so on. This is a list which could have been written a decade ago. While it acknowledges the need to increase direct subsidies for affordable housing, the working group’s report stops short of suggesting how this might be done. 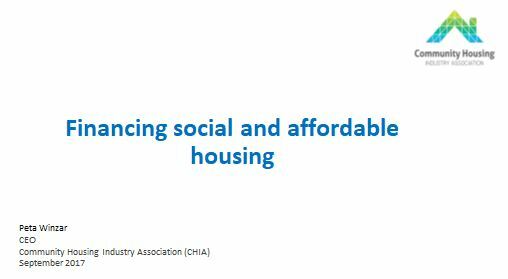 It also makes some valuable recommendations about strengthening the regulatory framework for community housing, and overhauling the national industry development framework for community housing. The aim of the bond aggregator (BA) is to raise institutional finance at scale from the wholesale bond market and then lend the money to Community Housing Providers (CHPs) for longer terms and at a cheaper rate than those offered by banks. The CHPs would apply for loans, pay a small fee towards the administrative costs of the BA and their borrowings would then be aggregated. the proposal that the borrowing be secured against the title of properties held by the CHP, which raises interesting questions about the conditions under which state governments would allow properties under long-term management by CHPs to be used as security for a loan. Treasury is seeking feedback on these questions and others as part of its broader consultation on the structure and operation of the NHFIC. The Commonwealth Government is currently running a consultation on the National Housing Infrastructure Facility (NHIF) and the NHFIC. 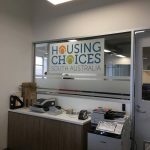 What’s innovative about this in a housing context is that it is a legislated vehicle at the Commonwealth level but it will be able to invest in City Deals at the state and territory level. It will also be able to invest in projects at the government’s direction and the aim is for its investment returns to enable it to be self-sustaining over the medium term. Note that it is intended to prioritise development projects with an affordable housing component. The consultation paper on the NHFIC and the NHIF is on the Treasury website, consultation closes on 20 October 2017. You can download Ms Winzar’s presentation here.